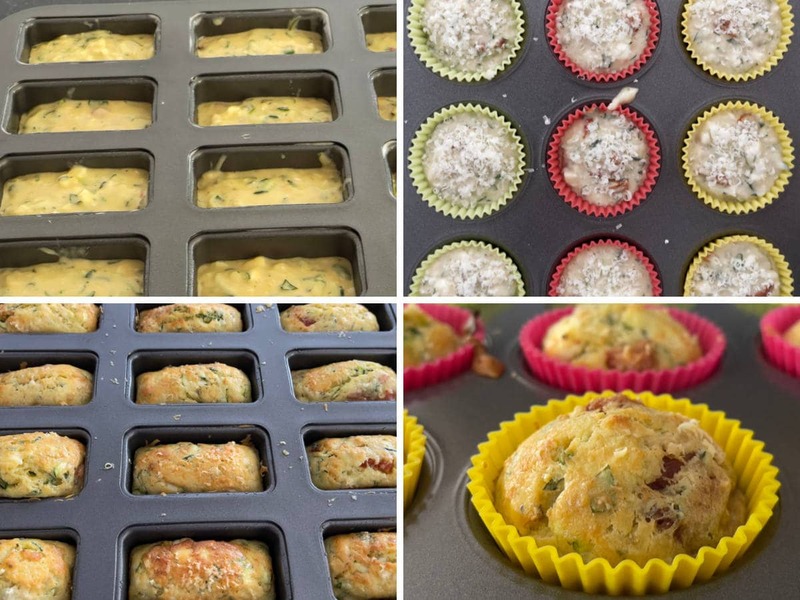 Courgette, Roasted Red Pepper & Feta Muffins – delicious savoury muffins packed with Mediterranean flavour! Perfect for picnics & lunch boxes or even breakfast. I thought I’d share with you the last of my courgette recipes for this season, a sort of final taste of the summer – or as OH has noted, a temporary end of hostilities in the Courgette Wars. I’m pleased to report that not one of our courgettes has been consigned to the Kitchen Shed compost this year and I’ve still just enough courgettes on the plants to make a single batch of Courgette & Ginger Jam or maybe a Spicy Courgette Chutney. 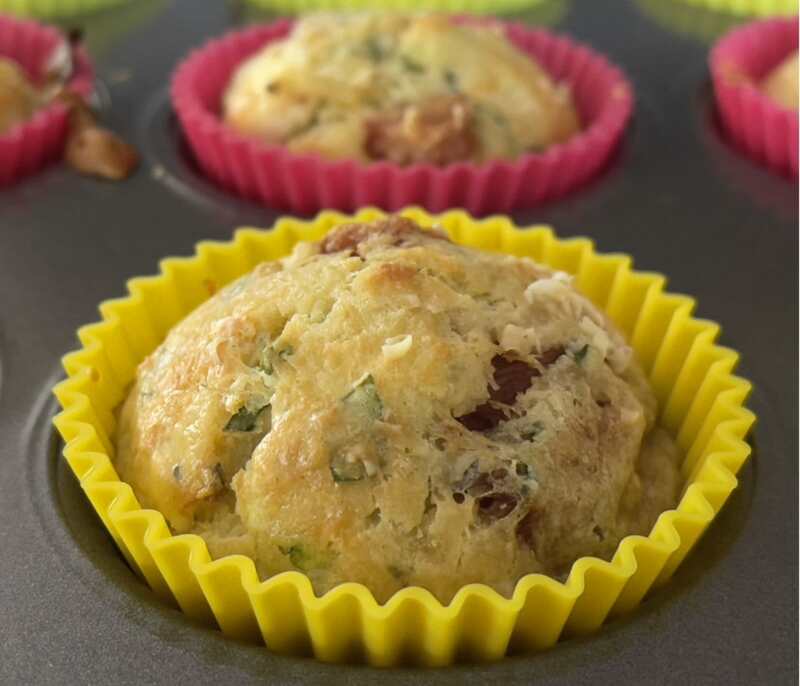 This recipe is for a flavour packed savoury muffin with the courgette doing a fantastic job of keeping the whole blend soft and moist. 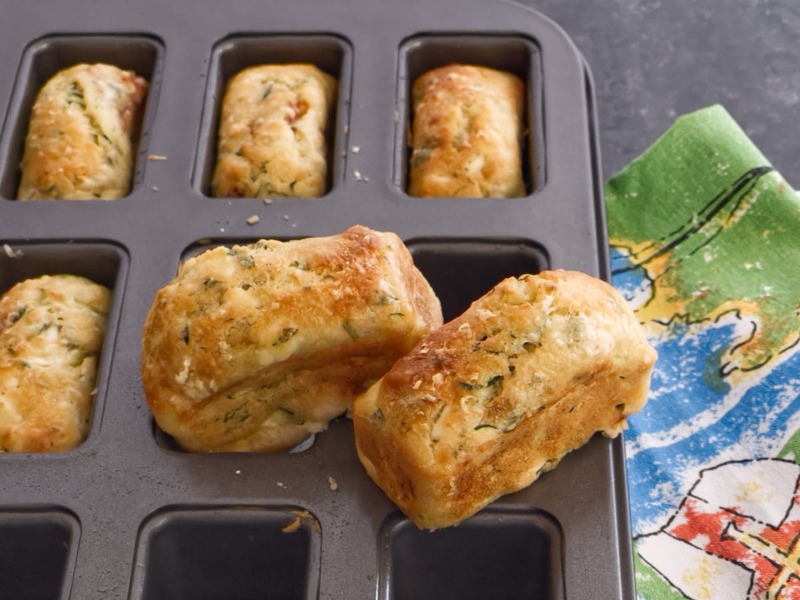 These cheesey savoury bites are delicious with the lovely saltiness of the Feta and little pockets of roasted red pepper blending perfectly alongside the basil to deliver a tasty Mediterranean style treat. Perfect for picnics and lunch boxes or even breakfast. Courgette, Roasted Red Pepper & Feta Muffins - delicious savoury muffins packed with Mediterranean flavour! Perfect for picnics & lunch boxes or even breakfast. Place the grated courgette into a colander over a bowl and sprinkle with the salt. 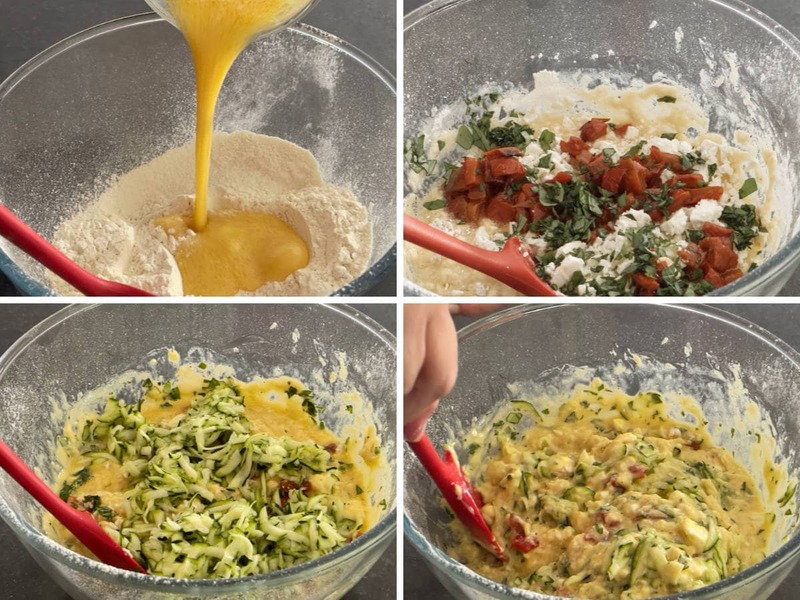 Leave to drain while you prepare the rest of the ingredients. Sieve the plain flour and baking powder into a large bowl. Lightly whisk the eggs, milk and rapeseed oil in a jug. Pour onto the dry ingredients and lightly fold in. Add the crumbled feta, red pepper and basil and lightly mix. Add the squashed grated courgette and mix evenly. Evenly distribute the mix into your mini loaf tin (1 heaped tablespoon per hole). Sprinkle with freshly grated Parmesan. Bake the muffins or mini loaves for 25 minutes. Leave to cool in the tins for at least 10 minutes before turning out onto a wire rack. It's best to work quickly and not overwork the mixture or you will end up with tough muffins. Credit Crunch Munch created by Camilla from Fab Food 4 All & Helen over at Fuss Free Flavours & hosted this month by Helen. Elizabeth’s No Waste Food Challenge over at Elizabeth’s Kitchen Diary, hosted this month by Claire at Foodie Quine. 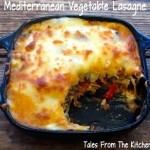 The Extra Veg Challenge created by Michelle from Utterly Scrummy & Helen from Fuss Free Flavours & hosted this month by Katie over at Feeding Boys. These look delicious. Thank you for the recipe. I have just made a batch, currently in the oven and looking forward to trying them. Can they be frozen and reheated? Hi Jenny, I’m pleased to hear you’ve made some Courgette Muffins. They are fine to freeze and reheat well. Thanks for popping by. Couldn’t rate it 5 stars on my phone, but it definitely is! Made these today for lunches for the week. They are delicious!!! Made ours in cake cases. Just wondering if you knew how many calories are in one muffin? 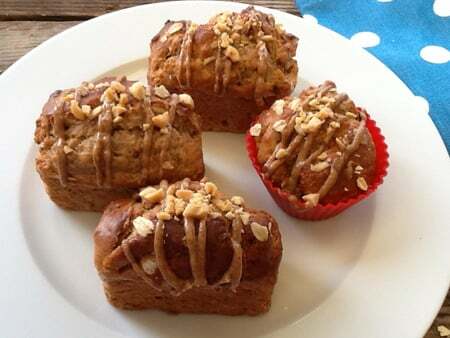 Thanks for the positive feedback and it’s a pleasure to share the recipe Sophie. I haven’t put our recipes into a calorie counter yet but it is on my to do list so I can’t give you a calorie per muffin at the moment I’m afraid. I had to google, “What is courgette.” 🙂 Looks yummy! Thanks Danielle, I was wondering whether to put zucchini in brackets for my US readers . I bet the feta just makes these taste amazing. Any with feta gets a thumbs up from me and these sound delicious. Thanks Gillian, the feta does work well in the muffins. 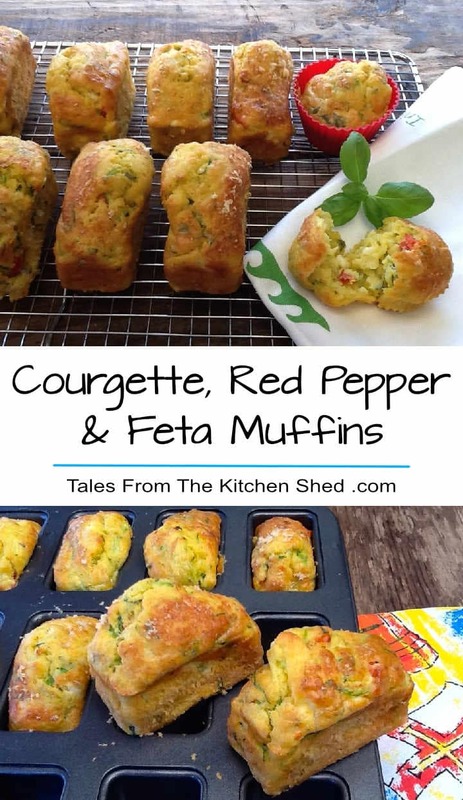 I love the sound of a courgette, roast pepper and feta muffin! This very creative as always Sarah, I’m sure my wife will love this combination. Thanks for sharing! I love that combination!! Sounds so yum. Feta is my favorite – I often crumble it over roasted rec peppers so I know it’s an amazing combination. Can’t wait to try. Wow these look awesome. Love how they are jam packed with veggies. Feta is one of my favourite cheeses…so this is a winner for sure. I will also say I LOVE the muffin pans….looks like another kitchen gadget to add to my collection. I wish I could find this mini rectangular mold ! Makes a nice individual shape compared to the ’round’ style. Plus your flavors are spot on for my palette! yum! Thanks Marie – Pierre. The mini loaf tin is from Lakeland here in the UK. Love zucchini bread, and the feta and roasted red pepper addition really makes this superb! Adore the mini loaves! Thanks Jacquee, the mini loaf tin is one of my favourite tins to bake with. Such wonderful flavors! I love the shape of the muffins using the mini loaf pan. So cute! Definitely perfect for a picnic. Thanks Tara, the muffins do make a tasty addition to a picnic. The mini loaf tin is proving to be a hit with readers. These are like all my favorite flavors wrapped up in a delicious package. I can’t wait to make these! These look adorable! I love making muffins but now I NEED mini loaf tins. I am in love with this very healthy muffin. I will definitely try this one. Thanks for sharing. I didn’t know until now that zucchini was also known as courgette. Thanks Suchitra, let me know how you get on. You’re most welcome, I thought I’d enter my muffins under zucchini & not courgette just in case. Thanks for popping by. These do look yummy, especially the little loaf shaped ones. I made some savoury muffins last year but really need to have a go again! Thanks Corina, it’s really worth having a go, I seem to be making more savoury muffins than sweet at the moment. These look fantastic, such a great way to sneak some veggies into the kids! These look wonderful! They would be great to pack in my kids’ lunches. I will have to try this recipe! Thanks Alison, everybody seems to like my Lakeland mini loaf tin. I am exceptionally sad that it is the end of summer and that there has not really been a summer. I am off to Italy tomorrow for a week and hope that it will be warmer. I never think to make savoury muffins, but these sound wonderful 🙂 Happy FF! These look delicious, I have been thinking about doing something similar myself but have just kept not quite getting round to making them! Thanks Caroline, I was going to make these earlier in the summer too, time always seems to runaway with itself. How great are these!! We always have all of these ingredients at home. I think I might make a batch for lunch tomorrow. Perfect! Thanks for linking up with Fabulous Foodie Fridays! These sound and look delicious. Feta always makes everything taste sooo good! Will definitely be trying these! Thanks Chantelle, everybody seems to like my mini loaf tin from Lakeland. I had a feta and pumpkin muffin down in Albany, this recipe has just reminded me how much I love savoury muffins. They look scrummy! I can’t wait to try them 🙂 Yum! p.s your mini loaf tin is sooooo cute. I need to get one! Thanks Claire, feta and pumpkin sounds delicious. I had the mini loaf tin for Christmas, it’s been in constant use since! I love this flavor combination! Oh Sarah these are just to die for, love them! Thanks Camilla, I took a batch to an afternoon tea and they soon disappeared. 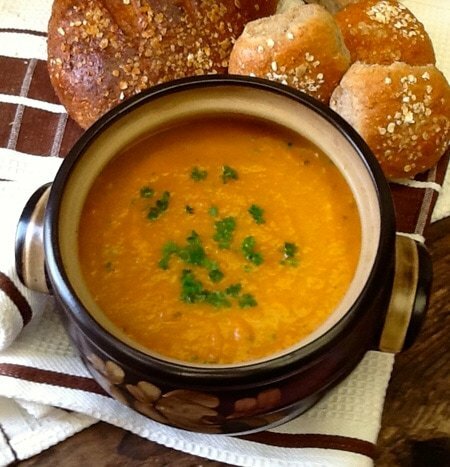 Oh my goodness those look so delicious….savoury dishes rule! I have to make these mini loafs and then eat like 3 in a row. Thanks Mandy, I’m always looking for an excuse to bake with my mini loaf tin from Lakeland. Thanks Ciara, feta is one of my favourite ingredients at the moment. Let me know how you get on and thanks for popping by.